Anticipation (or Antic) – The set up before an action. Without an antic, the following action looks jerky or the audience will miss it altogether. Virtually every action requires an anticipation before it in order to be seen. Action – The actual movement itself, without the antic or settle. Often the least important part of an overall action. With a strong antic & settle, an action can be skipped and the audience would still know what happened. Settle (or “Follow-Through” or “Reaction”) – The final settling of the character into a rest position. Without a good settle, a character unnaturally “jerks” to a stop. There are generally two types of settle; the “over-shoot”, and the “moving hold”. Over-Shoot – Taking a character further than it’s final rest position in order to settle it. Generally this is a quick, snappy way of settling, normally used on ‘cartoony’ scenes. For this assignment we’ll settle with an over-shoot (We’ll get into the moving hold later). 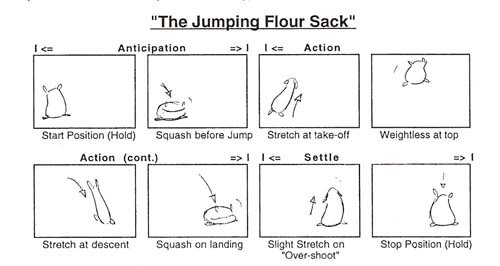 Following the storyboard below, make the little flour sack character anticipate, jump(action), and settle. 1.Draw your keys, breakdowns and inbetweens, very fast and very rough. 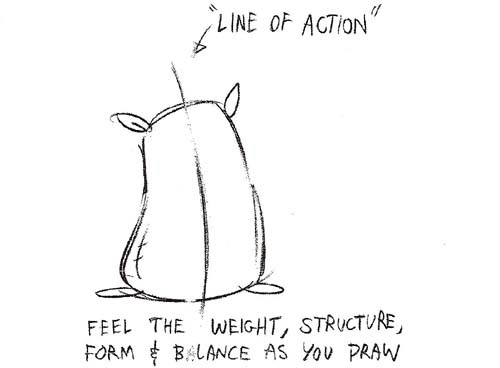 2.Remember, animation comes first, good drawings come later. Try to get me to look at your roughs before going into cleanup before the end of class. 3.Clean up keys first, then breakdowns, then inbetweens. 4.Think of the flour sack as a little character with a mind and muscles of it’s own. 1. Finish jumping flour sack assignment. 2. Midterm is quickly approaching, use this time to catch up on any missed assignments. 3. Read pages 67-84 in text.